With Stunning Bedford Basin views Ocean Brook Park hasbachelor, 1, 2, and 3 bedroomapartments for rent in Bedford. 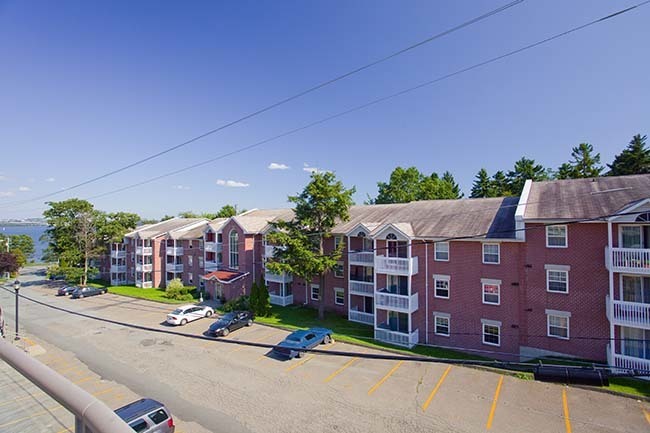 These stylish, spacious & welcoming Bedford apartments include heat, hot water andboast spacious foyers, secure intercom entry, elevators, convenient laundryfacilities, summertime car wash bay, beautiful gardens along with the serenesound of the rushing brook. Other amenities in these quiet apartments are: Playgroundfor children to enjoy, fitness room, large walk in closets, private balconiesas well as 2 baths and ensuite laundry in our large 3 bedroom apartments. A short bus ride connects you to downtown Halifax with Highway102 access nearby, but for those wishing to enjoy all the Bedford has to offerOcean Brook Park is just moments from groceries, restaurants and the FamousFisherman's Market. Residents can alsoenjoy a stroll on the Bedford Boardwalk. Schools nearby include: Wentworth Park Elementary, Halifax West HighSchool, Clayton Park Junior High and Mount Saint Vincent University. With such close access to downtown Halifaxthese beautiful Bedford apartmentrentals located on a quiet cul-de-sac are the perfect place to make yournew home. Enjoy A stroll on the BedfordBoardwalk, or watch deer from the serenity of your own balcony each evening.